Love Winter created a skull on an egg. 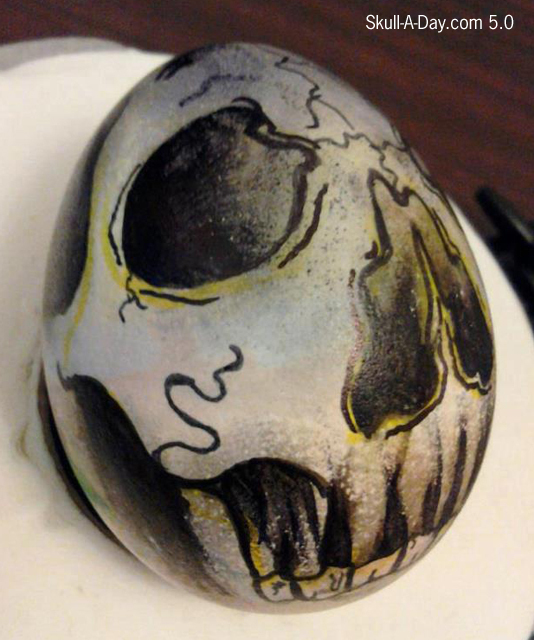 I've loved dying and painting eggs since I was a little kid. That is my favorite part of Easter celebrations. 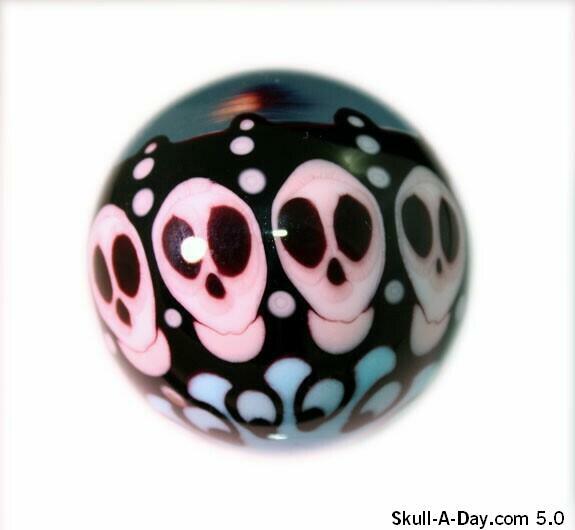 I like seeing how different people decorate their eggs. 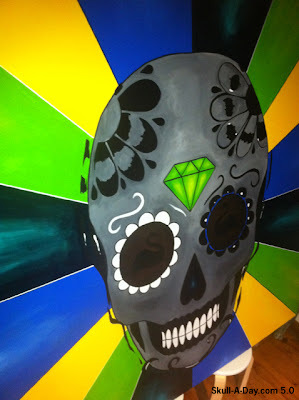 From using paint, dye, wax, glitter, stickers, markers, crayons, and/or carvings, the only limit is your imagination. You can see 1-25 as a group HERE and the 26-50 as a group HERE. Another soft focus piece, these are definitely easier to accomplish when working with stippling, though it requires a lot more patience than other styles of working. 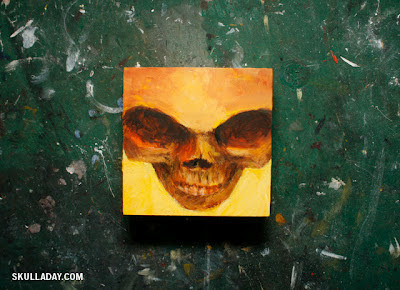 Today's skulls were found in unexpected places. Erin Hatch of Salt Lake City, UT said "This is a picture of a pan lid reflecting the underside of the range fan." 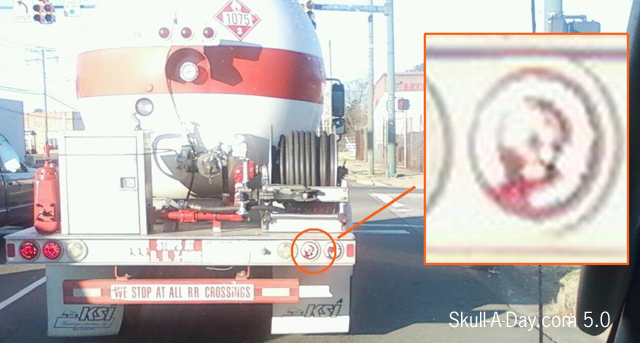 Dave of Colonial Heights VA said "I was sitting behind this propane truck at a rail crossing and noticed the rear taillight." We need help from our skull hunters. 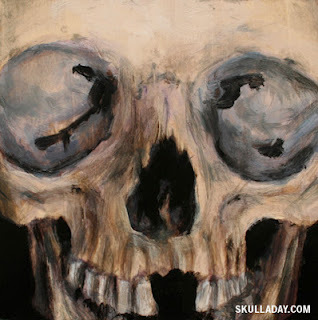 If you see a simulacra skull, photograph it and send those pictures in to our submissions address. For once, the Blacklist is the place to be. This tattoo shop in Lanse, PA is where Christal Musser and her husband inject craniums into epidermises with a variety of designs to satisfy any type of skin. 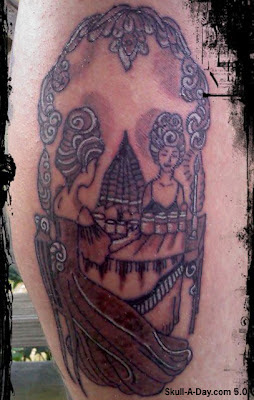 Skin art is still some of my all time favorite(of course). 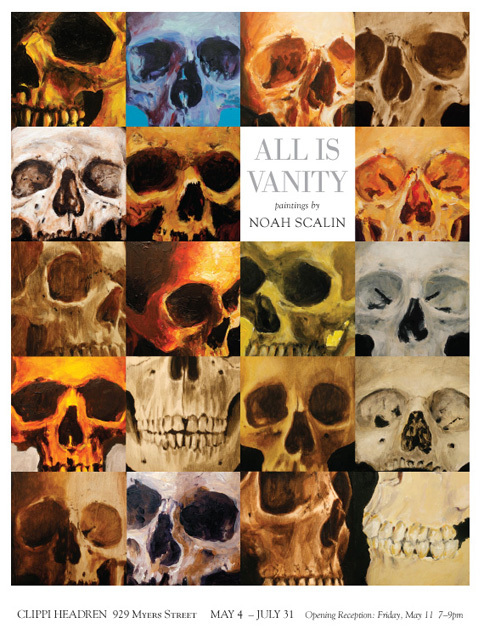 The conscious choice to wear your skull on the outside lets others know that you are enough of a realist to remember that the braincase you have is the only one you were given, so why not pay homage to it? 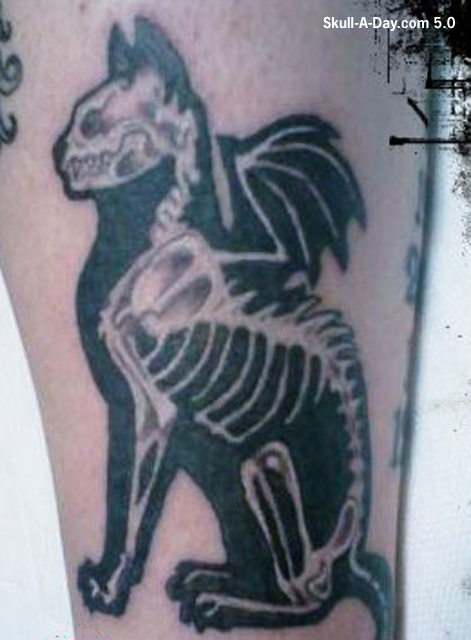 I like that you use different styles and don't just get stuck doing the same effects for every tat you do, Christal. Variety is the spice of life and it applies to skull tats as well. Thanks for sharing the great ink works, Christal! 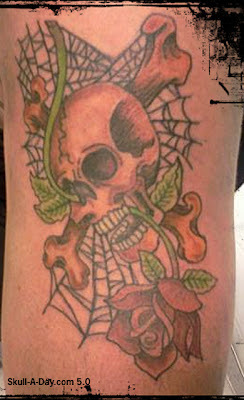 BTW, I currently have 16 various skulls inked on my own body. Is anyone else out there brave enough to share your number??? 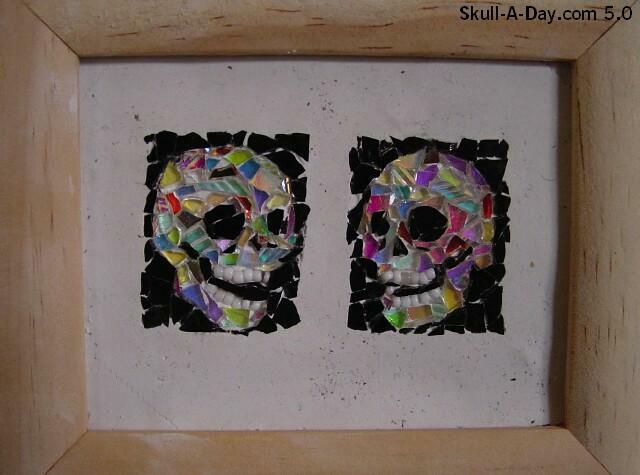 Artist Leah from Curious Art Lab sent us this skully piece that she created for the AlphaBeasts! project. You can lean more about the process to create this skull specific piece HERE, as well as, flashback to another of Leah's submissions to our site HERE and HERE. Thank you for sharing another piece of your illustrated family. 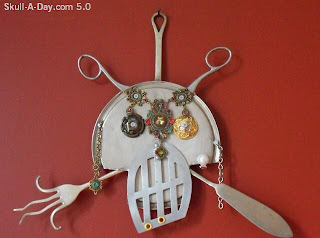 I had a wonderful time going through your created collection of “Oddments & Curiosities”. Also Thank you for being a long time reader and contributor to the Skull-A-Day project. This is a tricky angle to paint. 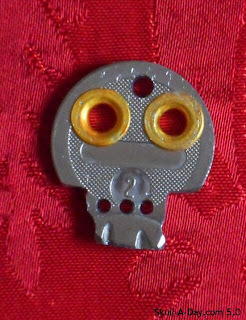 Looks a bit like an evil alien, don't you think? Welcome to another addition of Flashback Friday. ** This year the guest editors, Tatman, Citizen Agent, and myself, Azurafae are taking turns reflecting on 17 of our personal favorite skulls from the previous four years of postings. So please join us as we visit the archives and add our additional commentary on some of the original pieces. This colorful creations harks back to the fun toys of childhood. I didn't have a light brite as a kid, but my best friend Kit McSmash did. I'm tempted to buy one for my daughter, just so I can play with it...well and so she can too. 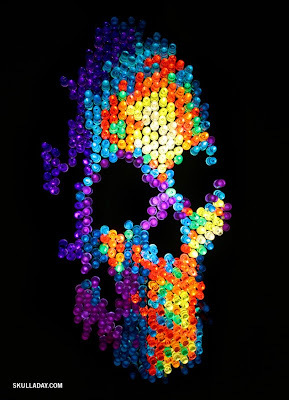 The Skull-Brite is more beautiful in person as it's rainbow of colors glows eerily. I have to resist playing with it, every time I go over to Noah's house. I recall this was his sister's toy, for which she isn't getting back, but can come visit. 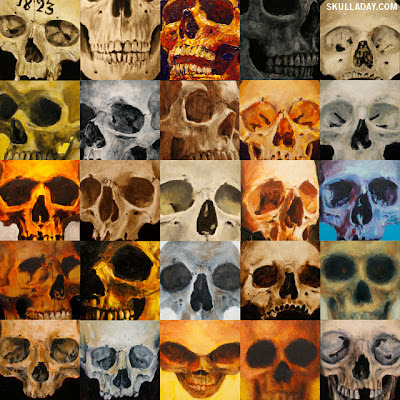 **Flashback Friday was a weekly countdown of the fan selected top 52 skulls of Skull-A-Day 1.0. 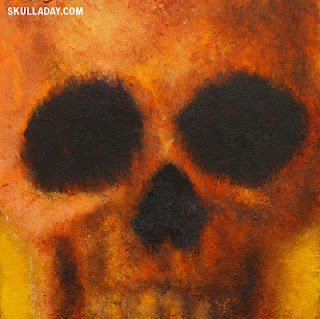 Each week during year 3.0 The Skullmaster posted the original skull along with some additional commentary in order from lowest to highest rated, with the #1 skull appearing in the last week of year 3.0, all 52 can be found here. During year 4.0 the editors had their chance to countdown their favorites Azurafae HERE, Citizen Agent HERE, and Tatman HERE. It's printed in silver and black-light reactive red & yellow-green on black acid-free paper by my friends at Team Eight and the stencil I used to create the art was custom laser cut by my friend Jason at BIG SECRET. You can buy it in the League of Space Pirates store HERE (where you can also get the original un-defaced version of the poster). And of course, if you're in the area I hope you'll come check out the show! 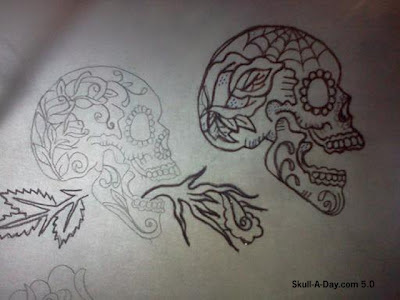 Daniel Allen created these two submissions. 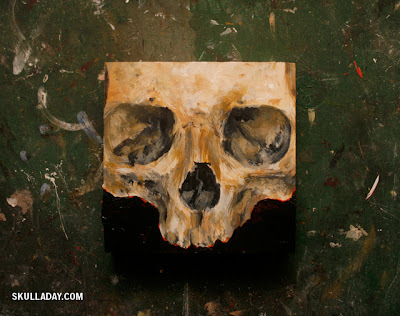 Many pieces of art have been created with inspiration from religion and war. Though I'm not religious and am peaceful, I can see the passion that people draw from these subject matters. 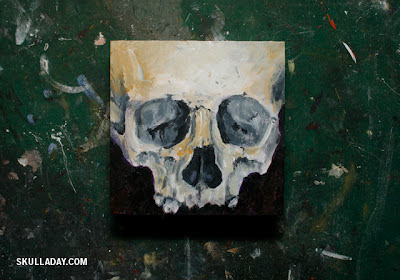 The styles are not all the same, as the personal interpretation is different for each person and artwork. 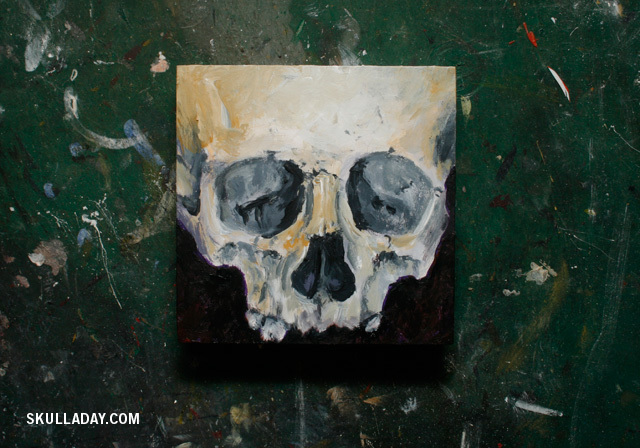 Art is a great way to release your inner struggles, joys, and pain. It is passion in physical form. After touring the farthest reaches of the universe League ofSpace Pirates return to Earth with a Cabinet of Cosmic Curiosities! 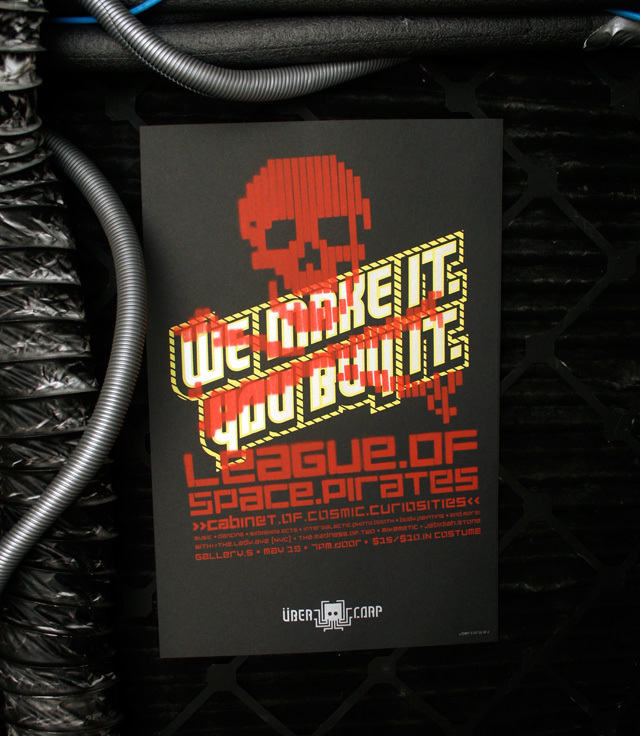 Experience the cosmic rock-n-roll of League of Space Pirates! Drink in the unbelievable acts of The Lady Aye! Bask in the sonic landscapes of The Madness of Two! Bear witness to the levitational skills of Jebidiah Stone! Feel the power of the sultry movements of Khalima! 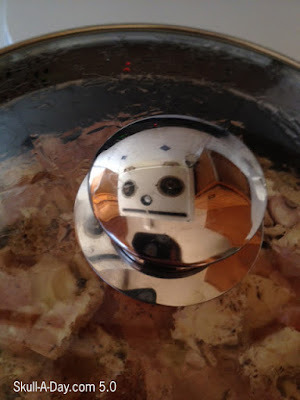 Shake a robotic tail feather to the mixage of Mikemetic! Mutate yourself with out of this world body painting by Shelia Gray! Document your experience at first ever Intergalactic Photo Booth! $10 Advance sale tickets available for a limited time HERE. Finally had a moment to get back to this project after all my recent travel. I worked with a larger brush the entire time and I started with a bright orange background, but it just didn't work, so I painted it black, but left a bit of the old orange visible, which I think gives it a nice pop. Given the heated rhetoric of the past few months, I thought this was a commentary on the situation surrounding your beloved Dodgers. Thank you for sharing this wonderful piece of personal style with us and hopefully your extra home team support will bring good things their way this season, and if they win it all this year, it will all be thanks to your mojo. 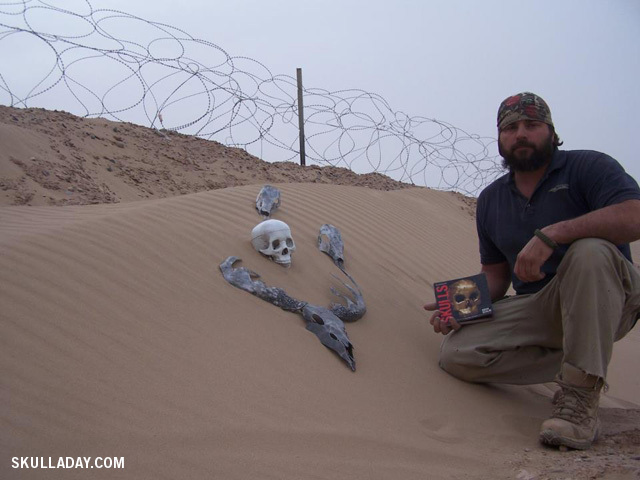 Ben Marcacci (whose work we've shared previously here and here) sent this great shot of himself with my book Skulls in Helmand Province, Afghanistan! I love seeing where my book has ended up! Do you have a copy of it? Share a pic of it in an unusual location and we'll post it here! 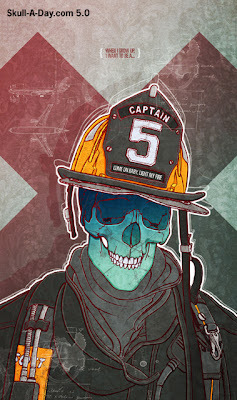 Bart De Keyzer is here representing his 3rd Floor designs which include this outstanding firefighter skull. A great representation about how the boyhood dreams of many can literally end in flames. Firefighters are a different breed for sure. Risking life and limb to save those in peril brings about daily consequence. 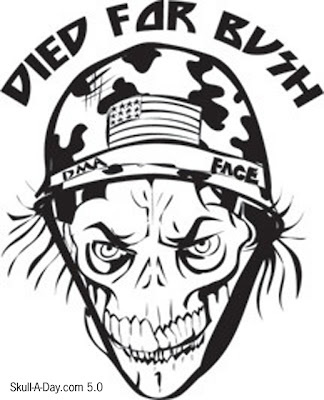 The skull is a fitting figure since the brave men and women who perform this public service see their fair share of tragedy as well. Let's take this moment to appreciate the skulls of all of those out there who don't think twice to look death in the face for the sake of saving another. 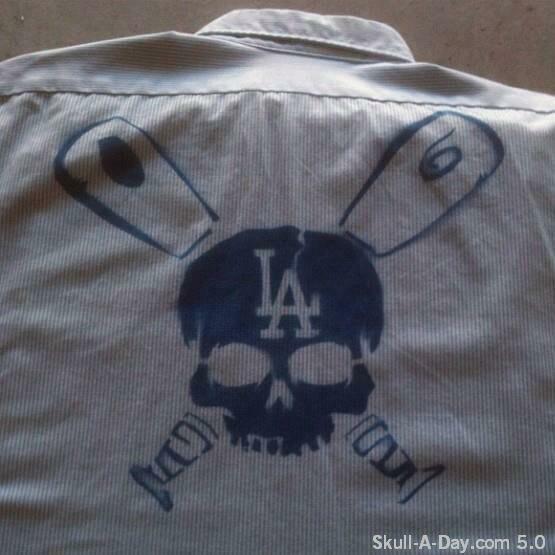 Thanks for the great submission, Bart! txo!? 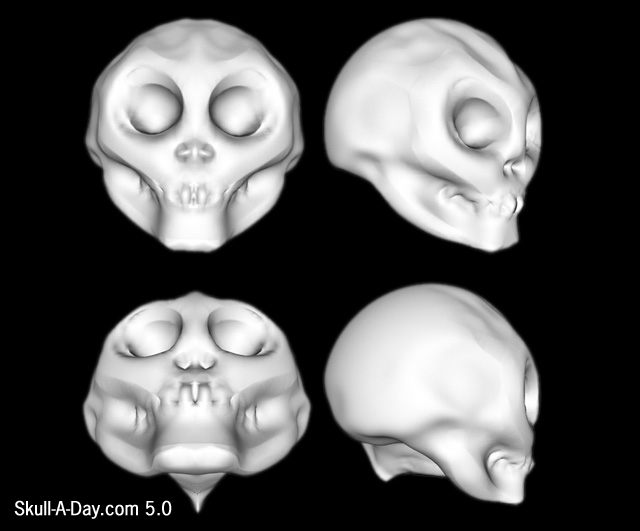 made a 3D and drew skulls on a tablet. Seeing the 3D images with the drawing reminds me of my digital animation friends doing character studies. There were always 3D renderings of the character "skeleton" with multiple drawings of it's "skin". This particular set reminds me of the Skeksis from "The Dark Crystal" movie. They were very reptilian and skeletal. Today's skulls were found in jewelry. Madame Curatrix in the US, "bought this vintage rhinestone necklace in a local antique shop. 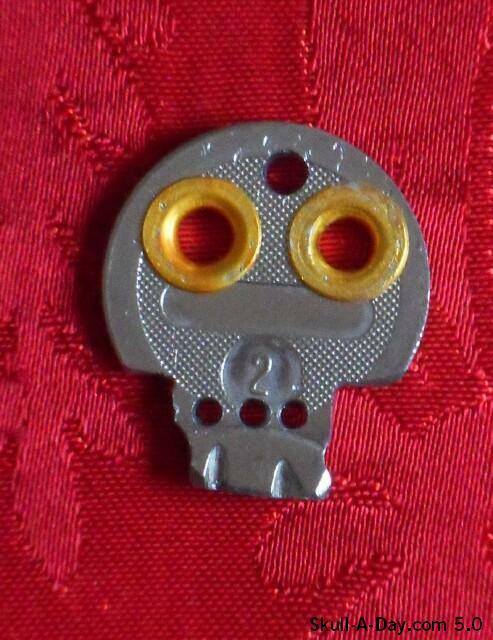 My first thought upon seeing it was that it resembled a cartoonish, bug-eyed skull. I wonder if the original manufacturers noticed that when they made it!" 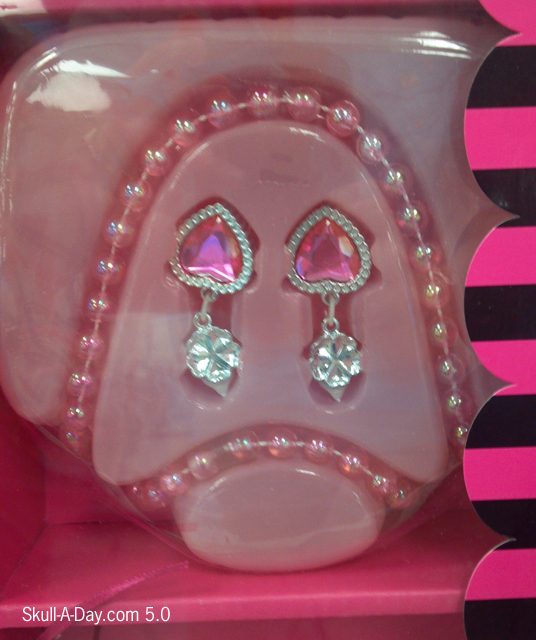 Pat Upton of Durham NC, "Saw this package of girls' jewelry at Ross Dress for Less." 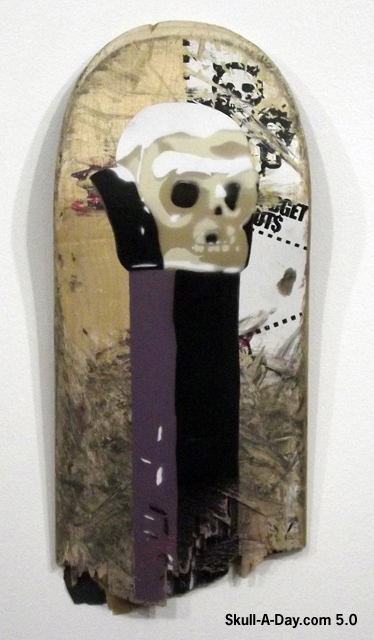 Motivated by the "Skulls" book, Rich Cihlar decided to take his love of Pez and skull art to a new level with these skateboard deck paintings. 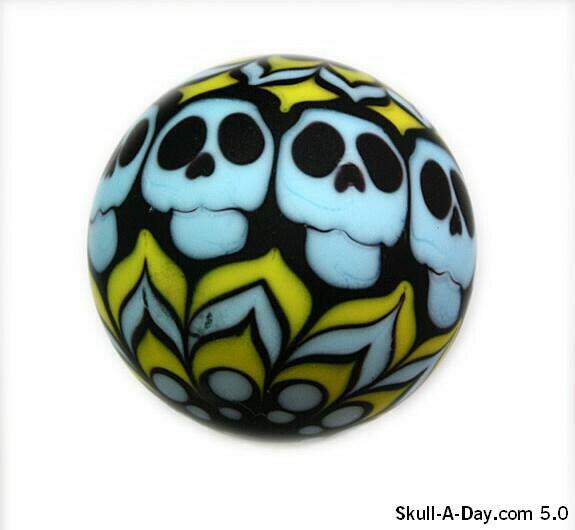 Reused and upgraded to display the sweeter side of skating skulls. 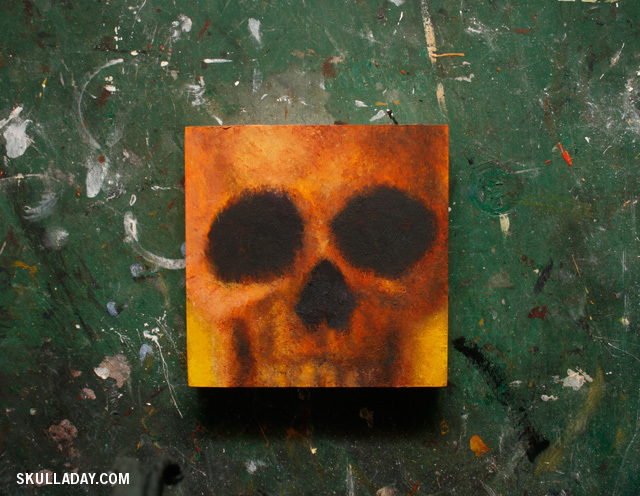 Rich's work is all done by using spray paint and stencils. Even with the same subject in both paintings, they take on different looks brought on by the different backgrounds. Rich has also decided to dip his toe into the 365 realm by doing a piece of Pez art everyday for the month of April. Check it out here. 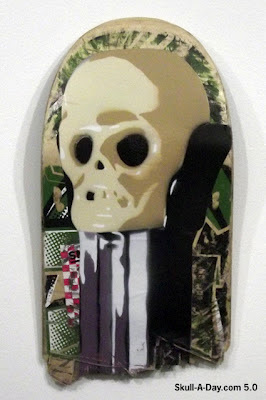 Thanks for submitting the sweet skate decks, Rich! 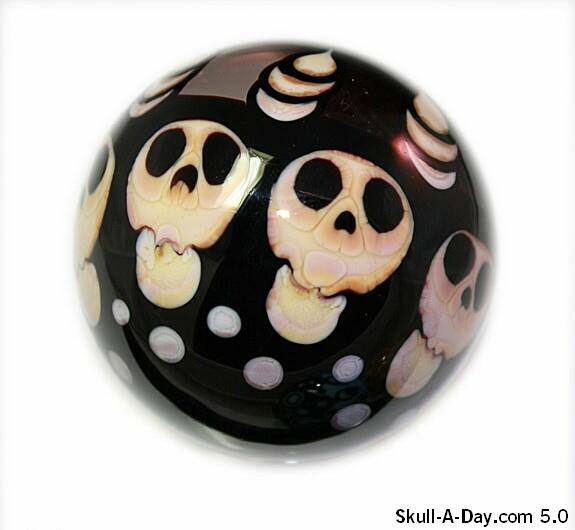 Artist Brad Pearson from Richmond, VA returns to us with a new batch of skull marbles that he recently created. 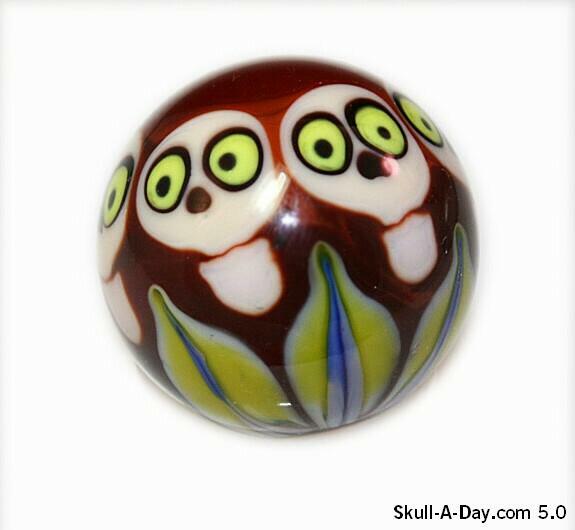 This group of marbles average about 1.5"each. It was wonderful to hear again from one our early contributors. We are always happy to see what you are currently working as well as knowing that you are still thinking about us. Thank you for sharing some of your recent skull themed creations with us. I've loved carved veggies ever since I saw my 1st radish made into a flower. 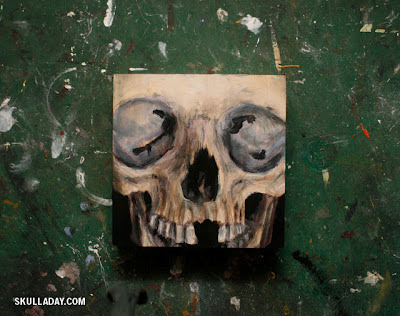 This cute little skull reminds me of those delightful radishes. 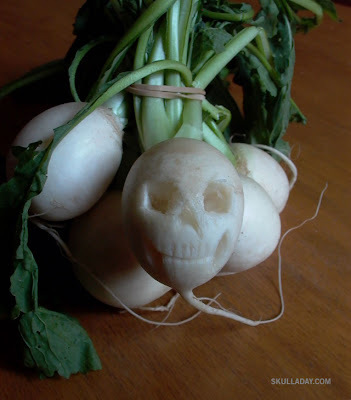 Makes me want to carve one up and make it the star of a meal, though I don't know what to make with turnips...besides skulls. 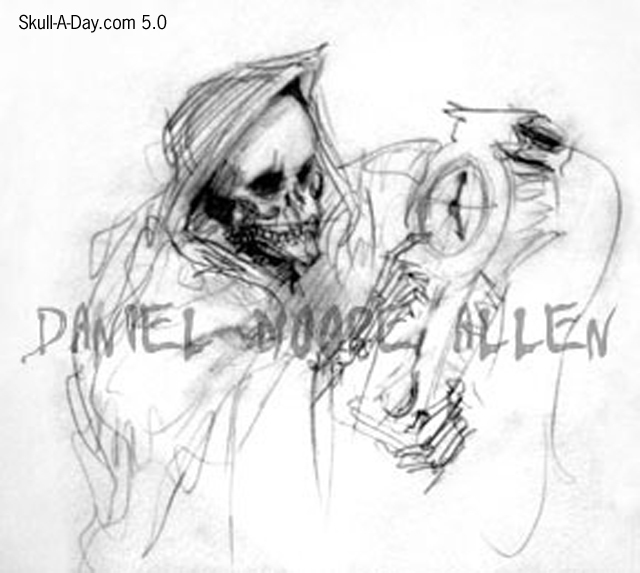 Donna Neal from Austin, Texas, submitted an image from her Santa Muerte series. She explained how it was created, "I shot all the elements for this digital print. Composited this one in Photoshop." I'm not normally a fan of digital composites, but I like the arrangement, subject matter, and texturing of this one. 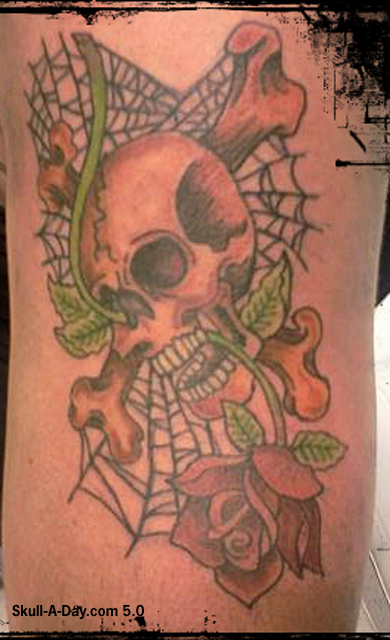 The skull texture reminds me of lace, which goes well with the vintage feel to the flowers. 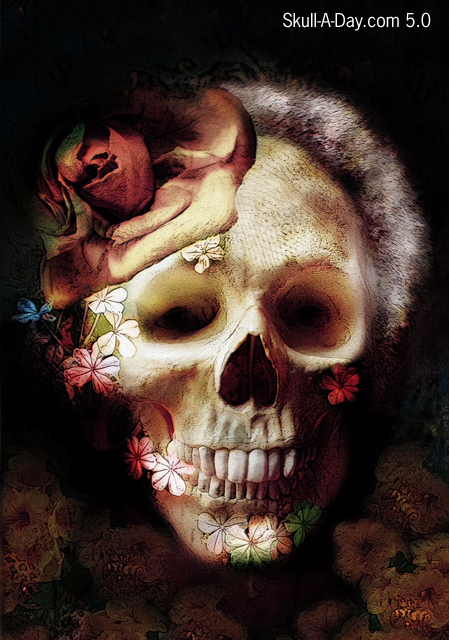 The flowers clinging to the skull reminds me of stories where bodies are found when new home owners digging in a garden. Though that has never happened to me, I always fear that when looking to purchase an old house with a large yard. Benjamin Pearce Chase from Victoria, BC Canada showed off this collection of mosaic skulls he created. 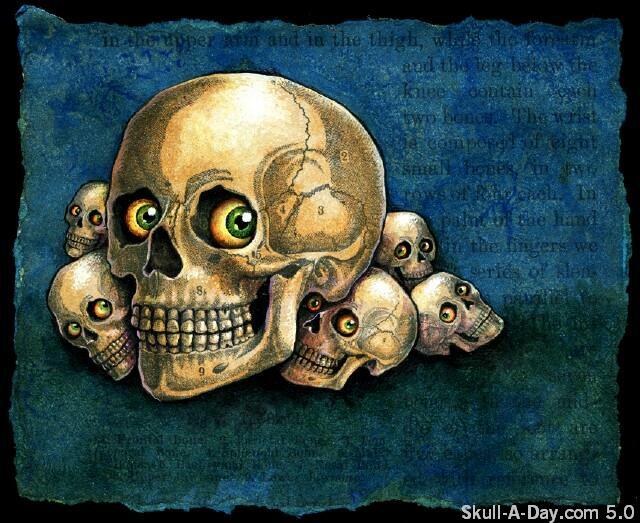 He told us that each skull is about 1". These pieces are prolific and amazing. It is absolutely incredible the amount of variation you are able to get with this project. Thank you for sharing these little creations with us. If you're in the area I hope you'll come out and celebrate the show at the opening reception on Friday, May 11th, from 7-9pm. 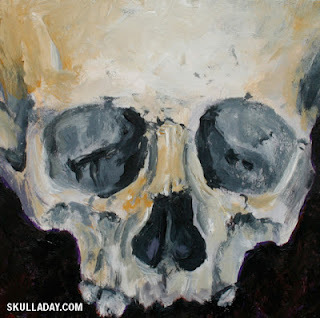 Skull Appreciation Day 2012 Exhibition/Giveaway! 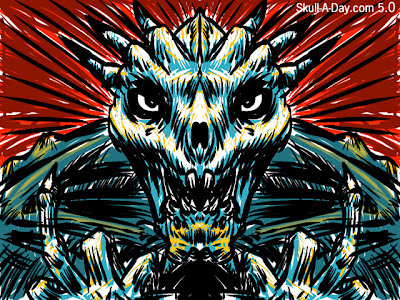 Skull-A-Day is taking Skull Appreciation Day on the road this year! The Skull-A-Day staff will be spending this June 4th at the Philadelphia's Mütter Museum with a one-day exhibition of skull art from around the world. We will be bringing dozens of original pieces of art from last year's Skull Appreciation Day exhibit along with a bunch of brand new mail art pieces! If you're in the area I hope you'll come by and say hi between 10am and 5pm on June 4th. 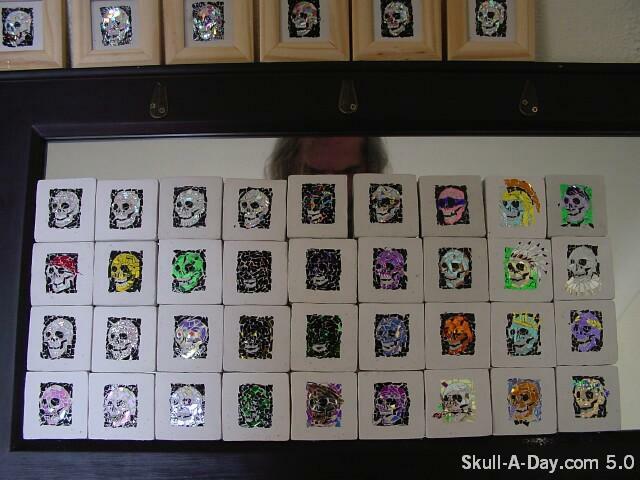 And even if you're not in the area, you can participate by sending in your own original skull mail art for us to display, details are HERE. *Don't wait if you want to get a pin! We'll let you know when we've run out. And don't worry, even if we run out of pins after you've mailed us your envelope, we'll still send you something fun back in it! 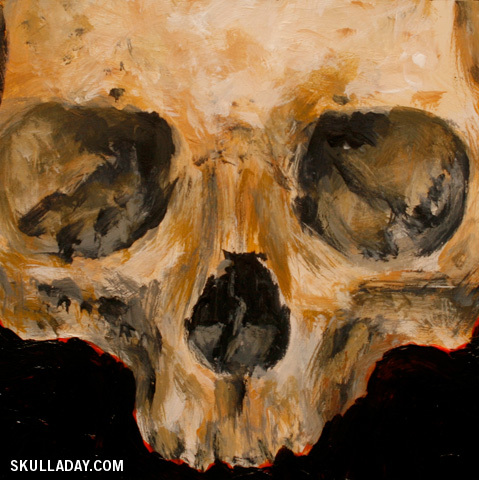 Mel Rudgley is here from a land down under with this very large and ornate skull painting. Very large indeed! Mel didn't include the dimensions of this piece, but judging from the angle of the pic and the fact that it looks like it's resting on a chair I'm gonna guess it is "very" large. Just like with tattoos, the bigger the better. Thanks for not letting limitations rule your creativity, Mel! Scott Johnson aka "BUFF" , created this "Glowing Orange" Skull for his band Glowing Orange. 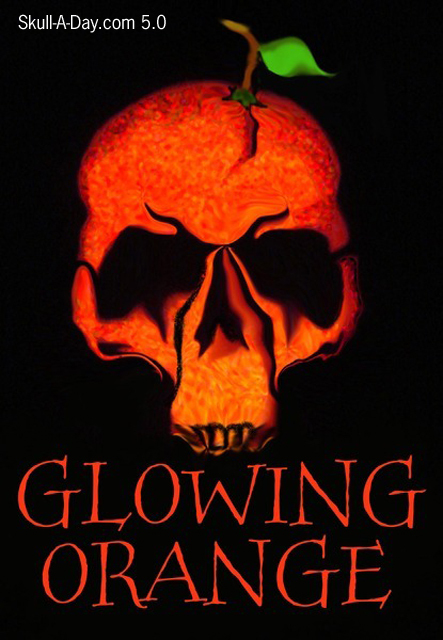 With Spring blasting pollen at everyone, my allergies could use a bushel of glowing oranges. I wonder if they are better at helping stuffy nose ailments than their regular orange kin? Or is it going to be like when Alex was a baby and she ate so many carrots, squashes, and sweet potatoes that her skin turned a bit orange? If that happens, hopefully I won't turn Simpson yellow and maybe just a nice faux tan orange. It's likely to kill me faster than my pollen allergies will. I'm going to drink some oj now...without that nice glow. 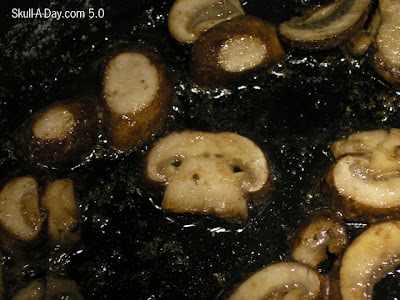 Bob Aul said "Unfortunately, this Crimini mushroom was harmed, but only in a way that mushrooms are usually harmed in the normal course of food preparation, and in fact the likeness only became apparent to me once the sautéing had already begun. So understandably I had to grab the camera before I added the wine." 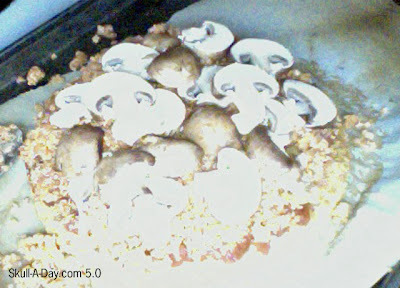 Christopher Deacon said "I was making pizza, and as I was slicing mushrooms, noticed they looked very skull-like. I thought this photo makes the pizza look kind of like a graveyard." Perhaps someday, when you're passing through Pottstown, PA., Clayton Moser will have a full sized version of this great looking skull house to display. 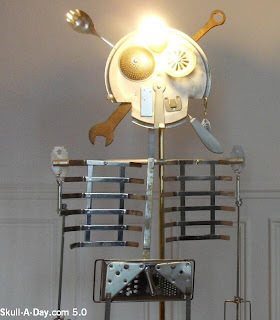 For now this innovative idea will remain just a drawing of imaginative proportions literally displaying the old adage that the "eyes are the windows to the soul". 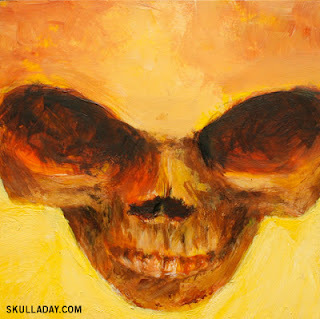 It would only make sense that there would be a skull shaped house somewhere in this world, and I'm sending out a challenge to anyone who has seen one. Heck, even if you just see it on the internet share a link with us in the comments section if you find anything. All I could find with a quick search was this longhorn skull restaurant. There has to be a way to make this house a home, and my building materials background is itching to find a way. Thanks for the inspiration, Clayton! 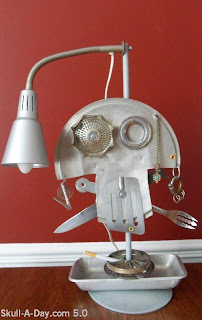 Artist “gille monte ruici” working in his cellar in a suburb of Paris, France is back with another collection of skulls that he created using recovered steel including: kitchen utensils, keys, plumbing, and random pieces of hardware of which some even light up. 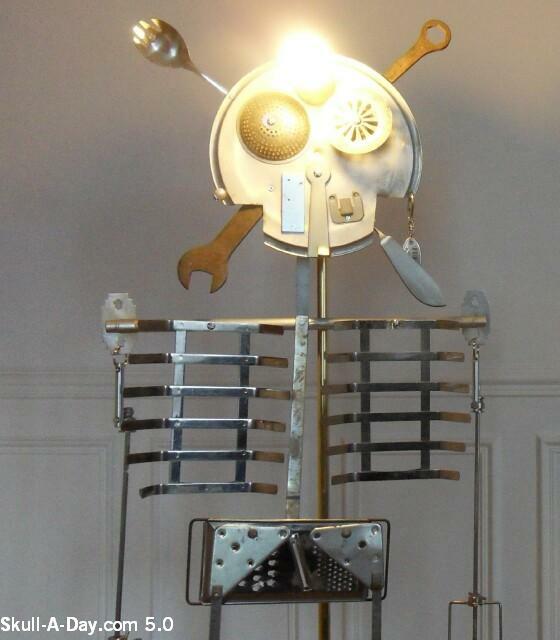 I am really impressed that not only do you incorporate lamps into your art, but the fact that they also are functional when you are finished with them is amazing. 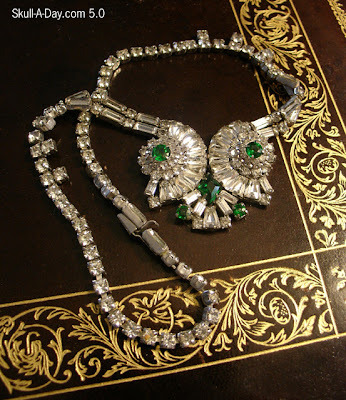 Thank you again for sharing another wonderful collection of your creations. Since it is Friday, lets flashback to another excellent kitchenware skull done by the Skullmaster during the original project. 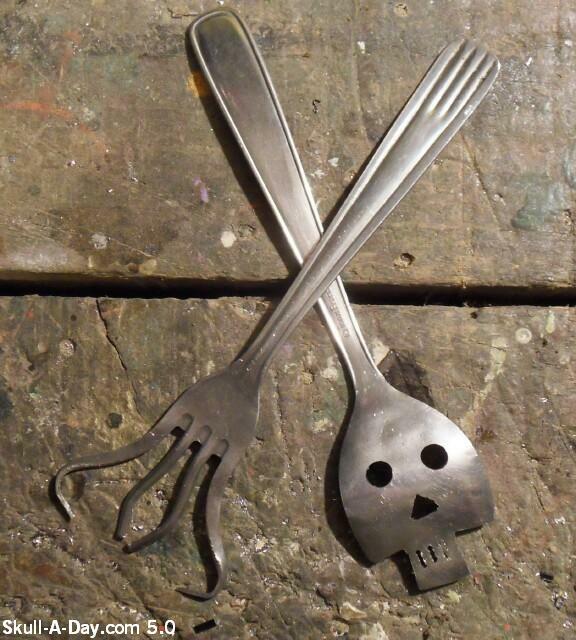 Also while we are going down memory lane lets look back at some of the other skull spoons that have found their way to our site. Starting with the Skullmaster's Skoon and followed by others like Clay Hoffman, Blake Highland, USMC Skulz, Pinky Diablo, and Dauvit Alexander to name just a few.